Berg’s photograph newsprints of the Carolina Phoenix. Last Saturday, multicolored lights swirled outside The Bar in downtown Durham and a crowd of what were ostensibly nighttime clubgoers filed in. Rather than sweaty bodies on the dance floor*, though, a large projection screen, rows of chairs, and tables holding bowls of movie popcorn filled the space. People were gathering for MFA in Experimental and Documentary Arts Candidate Amanda Berg‘s thesis film screening, part of her documentary project called ‘Every Body Hit Somebody’—a combination of still photography and film documenting semi-professional women’s tackle football team The Carolina Phoenix. Central to Berg’s work, both ‘Every Body’ and otherwise, are questions about gender, sport, community and society formation. Michaela sat down with Berg to chat about her current projects, the ethics of getting to know a group of people while documenting them, and the “everybodyness” of tackle football. Kenan Insider: So, first: why the title ‘Every Body Hit Somebody’? Amanda Berg: The phrase came from one of the loudest Phoenix fans. A father of one of the players liked to cheer from the sidelines, “Everybody hit somebody! Everybody hit somebody!” It is a spirited description of what goes on during a football game. It also implies equality in saying that “everybody” should participate in the hitting. Tackling is one of the most masculine aspects of the game and the thing society has the hardest time giving women access to. I chose to make it “Every Body” to hint at the relationship between playing football and forming an identity, the separation between mind and body. There is something very special about tackle football that other sports don’t have. The way bodies collide is unique to this game. 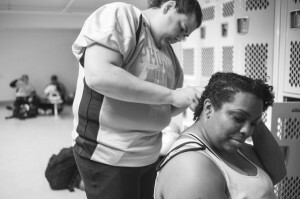 For many of the women who play football that contact is an empowering part of the sport and affects their lives in positive ways on and off the field. From Amanda Berg’s ‘Every Body Hit Somebody’ photo exhibition. KI: Your photography and documentary work has ranged from photo essays concerning women and binge drinking to film, photography, and zine work that engages the military communities of Fayetteville and Fort Bragg. What about this current project—and the stories of the women on this team—felt important to tell, to share? AB: It’s almost indescribable. The Phoenix seemed important from the first time I ever saw them practice— their love of football, their willingness to challenge gender boundaries, their vibrant, confident, diverse personalities and most importantly their success as a team. Winning a national championship is news— where was it printed? KI: At the film screening on Saturday evening, [Arts of the Moving Image Lecturing Fellow and Artist in Residence, as well as one of Berg’s thesis advisors] David Gatten talked about your relentless approach to artistic revision: you made a version of this film, and then made it again, and then made it again. What were some of the hardest decisions—possibly ethical decisions— you moved through before ending with the film/the project in its final state? AB: The hardest decision was editing out voices. I was able to do four big interviews. When I set out I imagined I would interview everyone on the team. In the final edit you only see two of those four. I struggled knowing how many perspectives the audience was missing out on. I think editing a project at all can be seen as an ethical dilemma, especially when you are representing other people’s experiences and not your own. 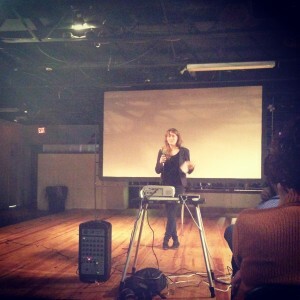 Berg announcing her film on Saturday night. KI: The mood of the event on Saturday is hard for me to describe. The screening and the event felt, in a lot of ways, like they belonged to the team—most of whom were present, chanting and being open about recognizing themselves onscreen. But that magic didn’t feel exclusive, either; I can connect to so many aspects of the work, from gender, to communities built around a sport or art, to the ways we carve out space in busy lives to pursue our passions. Would you say that there is an ideal audience for this film and for this project or not? AB: Saturday was special. I’m so glad you could make it! I don’t envision a ideal audience. I do think watching the movie for the first time with the team can’t be replicated. They are as much an audience as I am. I was a spectator of their season.On Saturday the roles reversed as they watched my performance. I hope the film moves through the world as a product of our collaboration. KI: What was it like to get to know the team through documenting them? Were there ever points when you had to take off the ‘artist’ or ‘documentarian’ hat? AB: Getting to know the Phoenix was like stepping into your favorite sports movie and being taken under the wing of the main characters. It was fun, inspiring and instructive. It’s a little hard to answer the hat question. Working on this project taught me how to be myself; the Phoenix showed me what it meant to be a confident woman. So even though there were moments [when] I was less focused on pictures and just enjoying myself, I was always in touch with who I was, why I was there. I think I just wore a really bright hat the entire time. A still from Berg’s film. KI: If you were to combine the words “ethics” and “art” in the same sentence, what comes to mind? AB: A few words pop into my mind: vulnerability, consistency, plurality, thereness, process, human, beautiful. *Writer’s note: There was, indeed, a dance party—after Berg’s film screening. Berg’s collection of photographic prints, part of ‘Every Body Hit Somebody,’ is on view in the Allen Building First Floor Gallery through this Friday, April 5. Find more information about the ongoing MFA in Experimental and Documentary Arts here.